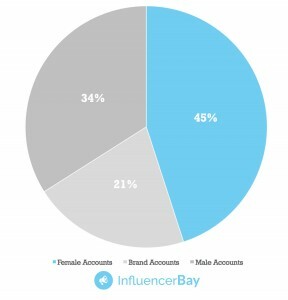 On Instagram, women are crushing it when it comes to online influence. Female Instagram users get five time more likes than male users. They have more fans, and more engaged followers. According to research, not only do they have a strong impact on female followers, but their content is also most likely to be shared by men. From beauty to tech, through fitness and food, women are playing a powerful role. 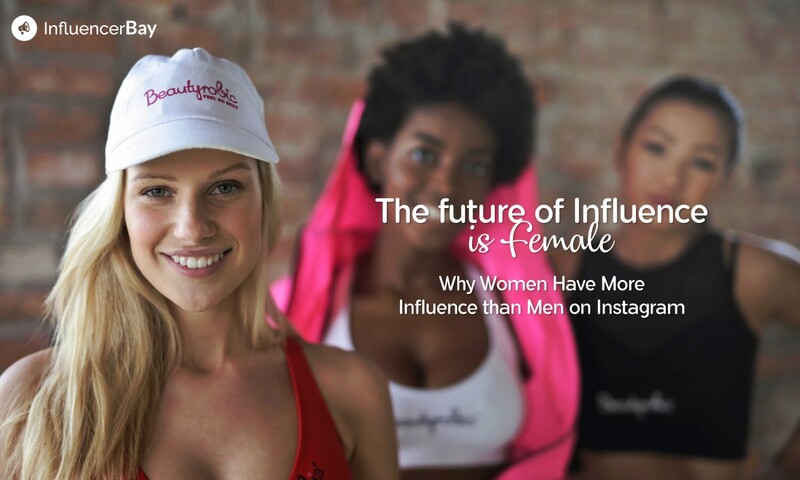 Beware marketers, you probably should focus your Influencer Marketing efforts on women! Women are more active on social media than men. This is true for every social media channel except Linkedin. 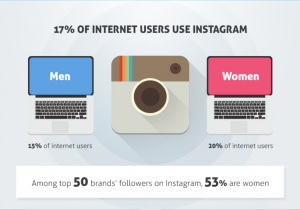 It has been found that 20% of women use Instagram (compared with 15% of men). Even famous women Instagramers have more fans than male celebrities. According to Socialblade, out of the 100 most followed Instagram accounts, 45 belong to women, comparing with only 34 for men. Top 100 Instagram accounts per gender – December 2017 . Source: Socialblade. According to the ranking, the most-followed person in 2017 was Singer Selena Gomez with more than 132.5 million followers. Women have more influence when it comes to engagement rates. Their followers are more active, and they are more likely to interact with their content. Data from HopperHQ showed that the average number of likes for female Instagram influencers was 578, compared to 117 for male users. Why are women getting more engagement? Sociologues are giving several explanations. First, the fact that women are in charge of their household purchasing decisions makes them a more reliable source when it come to giving advice. Think about it, who buys kids clothing, pet items, household products and decoration accessories in your home? Most likely, it is a women in charge of this chore. This is what explains the increasing success of women Bloggers and influencers. Women trust other women. Female influencers are a relatable source of information for other women if they have successfully been through a complex process, such as motherhood or weight loss. 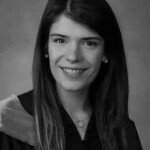 They become experts in their fields that share the knowledge that they have gained along the way. Women seem to have considerable influence on men as well. HopperHQ’s research showed that men are also 10 times more likely to share comment or like a woman’s post than posts by male Instagram users. This explains why Youtube and Facebook marketers are using the interest around female content to gain more clics on their videos and to buff up their stats. It comes with no surprise that the highest levels of male engagement comes with posts featuring bikinis, beaches, lingerie or workouts. Mike Bandar, co-founder of Hopper explained this trend “It’s no surprise that on a visual platform like Instagram, men and women are drawn to the most beautiful and aesthetically-appealing content”. According to Burst Media Online Insights, women are more likely to interact with brands to show their support. When a brand launches a marketing campaign, chances are that female customers will be using the coupons more than men. Women are more active when it comes to sharing content, commenting posts and offering feedback. Takeaways: Instagram has always been a predominantly female platform. These findings confirm that women are an unmissable target when it comes to digital marketing campaigns. With women leading purchasing decisions for their entire household, even male-focused brands should probably include women as a secondary target.